Unfinished Project: peace on the pch. After reluctantly tearing myself away from my sequined bathroom at the Madonna Inn, I headed north on the Pacific Coast Highway to Carmel where I would meet up with friends to begin Elizabeth's wedding festivities. I had absolutely no agenda except take lots of pictures of beautiful scenery, a task I'd looked forward to since planning the trip. Only leave it to me to choose a foggy, cloudy travel day where the visibility was almost zero. The bright side, I suppose, was that any worry I had about getting car sick driving along steep cliffs and on winding roads was quickly alleviated by the fact that I couldn't see the danger that was all around me. I could hardly see anything five feet in front of my face. Without the beautiful landscapes and the Ansel Adams photo shoot I had planned, there was plenty of time to reflect. Admittedly (and embarrassingly), I thought briefly about how much I'd wished I had someone to share all that I was seeing (or not seeing) with. But mostly I thought about how immensely blessed I was (and am) to have arrived at such a peaceful place in my life; grateful for a two week vacation in a beautiful place and eager to celebrate the much anticipated wedding of a dear friend with so many of our other dear friends. 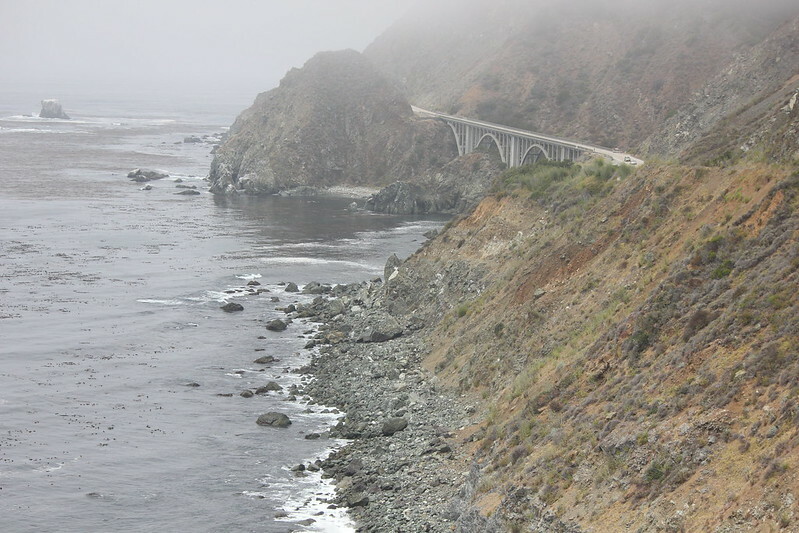 Even without much to see, there are still endless opportunities to be happy on the PCH. When I wasn't reflecting, I was concentrating - mainly on keeping the tunes pumping through my iPod and at keeping my hands at 10 and 2 on the steering wheel so as not to crash the rental car off a cliff. Just when I'd given up on getting to see any of the picturesque scenery I'd spent weeks researching and had been so excited about, the clouds and dense fog began to lift and the sun came out. I quickly pulled over to take pictures, smiling like an idiot at this unexpected shift in the weather. I certainly didn't need this weather metaphor to remind me about just how quickly and how vastly life can change for the better (and sometimes for the worse) in just minutes. But what a sign mother nature was giving me -- there are going to be days when the sky is gray, when visibility isn't clear, and it seems like the fog won't ever lift. Yet somehow it always does So grab an umbrella, turn up the music, and keep on trucking north. The sun's gonna shine eventually. Looking at people's vacation pictures - especially a solo vacation where all the pictures are of scenery or of an out of focus person (ahem, me) holding the camera for a self-portrait - is not really high on my list of fun things to do. So I set mine to the sweet sounds of Michael Kiwanuka and made a little movie to make them easier to digest. 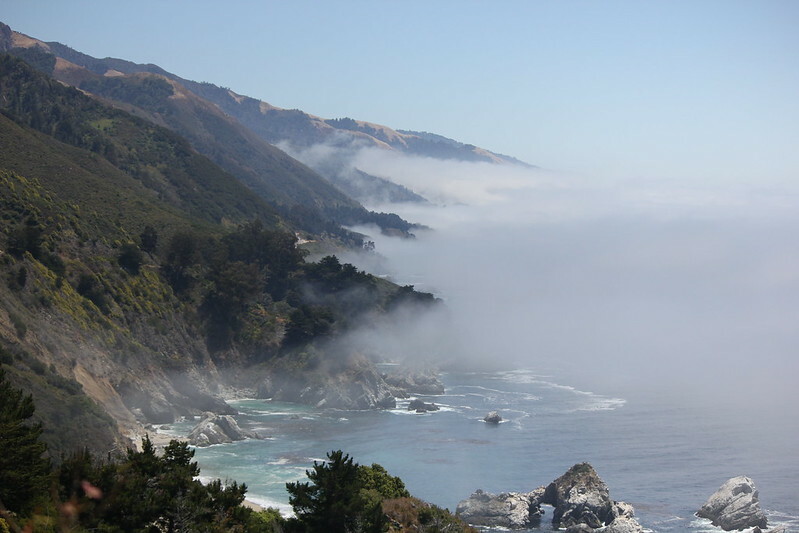 PCH from Stephanie Gallman on Vimeo. Love this post and your pictures! Your pics just made my whole day! I LOVE the PCH.